The latest news from ServMask Support team. There are 4 ways that you can choose to increase the maximum upload file size in WordPress. After updating to the latest version and installing the extension for all in one wp migration, it says the maximum file size is 20MB. Is this an error in the latest version? In the latest version, file import has been re-added with limits imposed by your server using wp_max_upload_size(). You can check out how to increase the upload limit in the article. Hello, can I write the code in #3 anywhere in the wp-config.php file? Also, on a separate topic, when I updated my page, its contents disappeared. This is why I’m hoping the backup will work. Is this a common problem (page content disappearing after update)? Yes, you can write it anywhere, but it is good to be around WP_DEBUG statement. I have not seen the page content disappearing after update – you might want to report it to Gutenberg project if this is the editor you are using. Are all 4 of the above required (and) or just one of the above (or)? Only one of the steps is required. Hi. when i clicked the 4. version [Use plugin], i celected to download the free version -512 MB. My antivirus said me that it have a virus and prohibits me to downdload. Help me please.. Some hosting providers allow the use of .htaccess file only. Reach over to your hosting provider and ask them what way the recommend. I have the Google Drive extension which is supposed to include “Unlimited” file size. I’m now capped at 64MB. Why is this? Can you make sure that the Google Drive Extension is updated to the latest version? Is this a typo in item 2? Yes, you are right. I’ve fixed it in the post. Thank you for helping! I recently found that new installs of All-in-one WP Migration were only allowing me a 2mb upload limit whilst previous installs on the same server allowed 520mb uploads. The solution to this was not to change any php upload limits but to install the plugin extension at https://import.wp-migration.com. Older versions of the migration plugin use a constant set in constants.php which overrides the maximum file limit to allow 520mb. For some reason the latest version of the migration plugin has this constant set but does not use it. The plugin extension restores the use of this constant and will save you a lot of time fiddling with php upload settings. A million bajillion thank yous! You, sir, are a legend. Thank you! THANK YOU SOOOOOO MUCH!!!! I was pulling my hair out because I couldn’t increase my upload_max_filesize any higher and it still wouldn’t work but I installed the plugin like you said(thanks for the link by the way) and BAM it worked!! After updating to the latest version and installing the extension for all in one wp migration, it says the maximum file size is 50MB. I’ve added upload_max_filesize = 512M in .user.ini. When I load http://domein/info.php it says: upload_max_filesize	512M (local) | 50M (master). Local Value overrules de master value. So the settings are correct. Stil i’m getting the message maximum file size is 50MB. Done all the settings, but then it hangs at upload 100% and won’t go to the usual next step, what’s happening? Hey Yani, I’m trying to upload a websitefile size 234mb to a new hosting provider. Already spoken to them and they have increased my upload file size to 500mb however I keep getting the same error message, maximum file upload size 128mb. Is it something I have done wrong?. Most likely, the hosting did not properly increase the upload limit. They have to increase both upload_max_filesize and post_max_size for the page to show proper limit. You can also use the file extension that will set it up for you without having to do anything with the code. This is ridiculous. Surely the limit should be based on the upload_max_filesize, which for most hosts can go up to 1GB, but post_max_size is usually far lower, around 128mb. Which means that individual php.ini files need to be set, which requires me to either have access or walk someone less knowledgeable through the process. For these cases, you can use the plugin described in the last step – it is free for files up to 512MB. Hi, Yani – hope you’re well. I’m on the same boat as Lexi. I’m in the process of building website templates and then giving customers the import file (.wpress) and a copy of the free All-in-One Migration plugin. I just tried to import the content to a blank WordPress site and it says upload limit is 2MB. I can’t require from 100ds of customers to buy the Unlimited Extension, just so they can import the website. Any chance you revert this specific function to the older version? I love your plugin btw. Aaaahhh… sorry, I misunderstood the purpose of https://import.wp-migration.com/ initially. I have downloaded the free version and used it. Works great. I own a web design agency and I create my clients’ website on my project center. I need to migration their website after it’s done. If I buy the Premium version, may I use it on all sites I have to migrate or is it just a 1-site licence? Could you contact us at support at servmask.com regarding the premium extension? I want to install its extension but it gives the below message. But i did not install and the max size is only 8mb. Thank you for the Support, Its working Correctly. You are very welcome, Mohsin. I have updated .htaccess, wp-config.php file, tried php.ini and even changing line in plugins file. Upload limit is still 128MB. I was testing this plugin on a free host and the file upload was throttled to 10mb. I assumed this was due to the nature of the free hosting so attempted to use the plugin on my paid host, and the file upload is limited to 8mb! Is this a WP/Plugin error or do I need to contact my host? Did you try to increase the upload limit or install the File Extension to allow uploading more than 8MB? It gets up to 100% and then it stops … why? Which option did you use to increase the upload limit – by using the File Extension or manually adjusting the PHP settings? hello, my export size is 2GB… what are my options to import my site again? You can try modifying the PHP settings (option 1-3) suggested here. If there is any way can I upload 650 mb file and check if it works or not ? Please try updating the PHP settings as suggested on this page. I successfully changed the file upload limit to 256mb but now I’m also getting the “100%” problem – it just hangs there. What can I do about this? Do i have to add these values because they do not appear in my .htaccess or config.php files? You can download the File Extension from this page: https://import.wp-migration.com, install and let us know if it works for you. I tried to do it this way but it is showing some kind of error. How to resolve this issue? Could you send an error to support@servmask.com? My provider won’t allow higher upload than 96Mb, fixed in their php.ini file. Changing the htaccess is resulting in errrors. Will the paid version still fix this?? 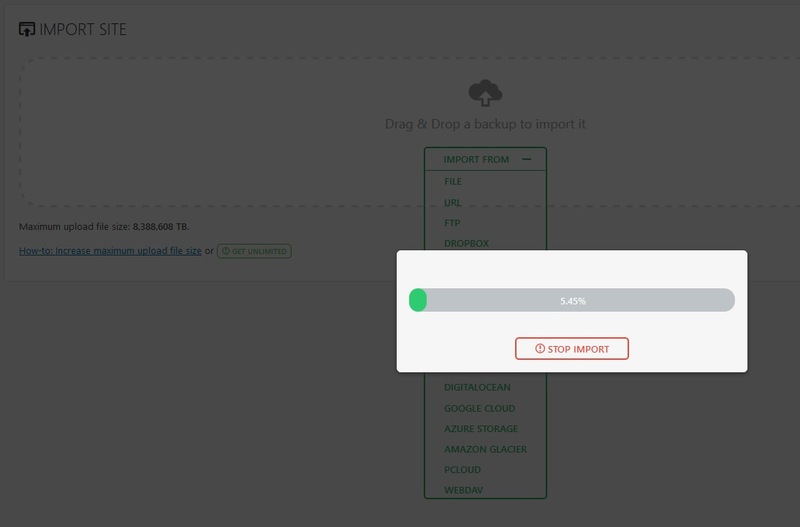 If your backup is less than 512MB, please download the File Extension from this page: https://import.wp-migration.com, install and import your backup to see if it works for you. You can give our plugin a review on https://wordpress.org/plugins/all-in-one-wp-migration. Hi, I can’t upload my file, the size is 296 mb, the process doesn’t start. Which option on here are you using to increase the upload limit? Please download the File Extension from this page: https://import.wp-migration.com, install and let us know if your issue still persists. I have increased the maximum file size to 700 MB. I am uploading a file of 520 MB size. It started fine, but hangs on 25.92%. Do I also have to increase the max execution time? Hi, when I want to export the file generated by all-in-one WP migration to a new site, the maximum upload file size is set to 128 MB. When I try to upload my file anyway The error message : “Your file exceeds the maximum upload size for this site : 128MB. How-to: Increase maximum upload file size or Get unlimited”. I suspect the hosting provider of my client to have set this limit and I have no direct way to modify the PHP or .htaccess. My question is : If it is my client’s hosting provider that actually did set this limit, will the unlimited version of the plugin fix my issue? Could you download File Extension (Basic) from this page: https://import.wp-migration.com, install and let us know if your issue still persists? Please download File Extension (Basic) from this page: https://import.wp-migration.com, install and let us know how it works for you. It works, The upload limit is now 512 Mb. Please download File Extension (Basic) from this page: https://import.wp-migration.com, install and let us know if your issue is resolved. Please re-download File Extension (Basic) and re-install. Where is the “.htaccess file” or “wp-config.php file” located? They are both located in the root directory when you log in with cPanel or FTP/SFTP. I made a backup of my files with your program All in one. but I didn’t know some issues. and more than 32 MB is not allowed to restore. I did not know that.my files 112 mb … and your files name WPRESS. Any program and php dont accept that.. What i will do. should i upragade?.. i dont have capital can you help me? Please download File Extension (Basic) from this page: https://import.wp-migration.com, install and import your backup. I have the Unlimited extension and the Import extension, but I can’t import a 42 Mb file and I also can’t Restore a Backup that I have loaded through FTP. Please help! The new updates have really thrown a wrench in my goto backup/import/restore plugin that I have used for years. I am on a GoDaddy server, by the way. Hopefully that doesn’t matter as this plugin has worked fine on the same server for a long time. Please make sure the base plugin (All-in-One WP Migration) and Unlimited Extension are up to date. Thanks guys. It worked when I updated both .htaccess file and wp-config.php file. I have successfully increased my upload size file. Thanks to the instructions. However, when I want to import the .wpress file of my site, the loading bar still display “0.00%” even after 15min. I therefore stopped once, and reloaded the page to try again. But still, importing doesn’t move any further. Ps: my file is 390Mb large. Please try option 4. from here. My English is not very good but I will try it. I have a problem, I’m doing all the steps as indicated, the exported file is 230MB, I can import it without problems but on reaching 100% of the import it stays frozen, that is, they spend hours saying 100%. – Is it mandatory that the import have the same domain name? No, I do not see any problem migrating from namesite.com to oldsite.namesite.com. Feel free to contact us at support@servmask.com if you need assistance. I am using the free version to test. My site is way less than 500 MB’s. I am getting this error. Please check out how to increase the upload limit in the article above. I used the .htaccess method and it was successful. Thanks. Now that the job is done, should I remove that code from my .htaccess file? Yes, you can remove the code after the migration is done. The plugin extension worked perfectly for me.